Bug and I traveled to visit Nana and Pappaw S. for the beginning of this week. Sister and her boys are here from VA as well. 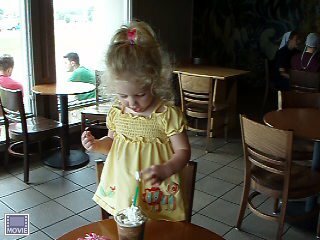 The trip went well and Bug enjoyed her own decaf Frappacino, especially licking the whipped cream off the top. We visited the Ohio River today on the Maysville side. 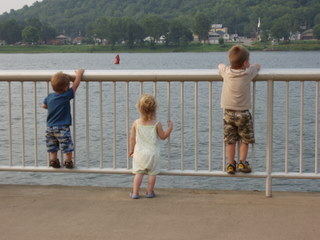 The kids had a ball throwing rocks and sand into the river and seeing a train. 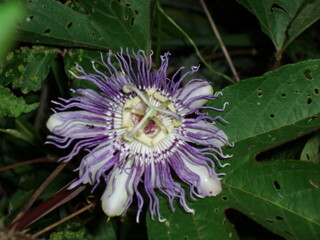 The passion flowers are blooming back home. 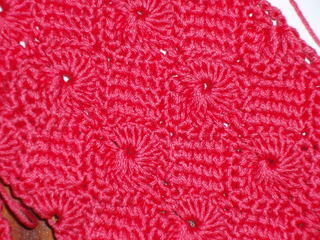 The ipod carrier knitting part is done, but I’ve decided to make a crochet border and cord to carry it around my neck. I’ll post pictures later in the week. 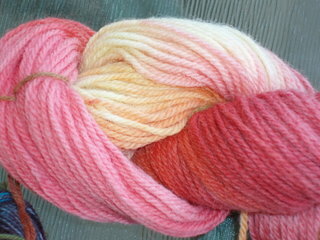 The kool-aid yarn is AWESOME to work with… pretty and smells nice. I started a scarf with the other kool-aid dyed yarn – an alternating moss stitch/stockinette stripey deal (at least for now). I’ll take some pictures tomorrow when I can use the natural light to get the colors right. I “heart” koolaid! 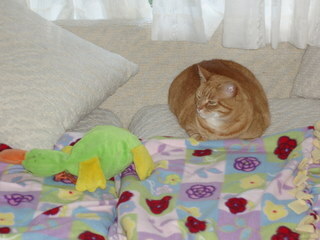 Our daughter’s beloved toy is a stuffed platypus named Pa. He used to be a toy at her daycare, which she found just as she was starting to crawl. The first thing she would do upon arriving was to seek out her “Pa” among a pile of stuffed animals. The teachers finally told us about this and gave us our first Pa. Since then we have acquired two more just like it, one smaller purple one and two tiny ones. 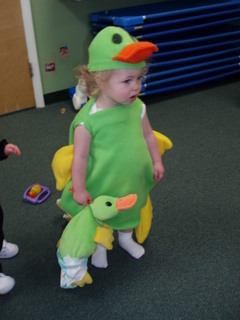 I also made two – one was her Halloween costume last year which I stuffed and sewed up (She got “Big Pa” for Christmas) and the other was made from some brown corduroys that were worn out (“Brown Pa”). Anyway, on to how to give a platypus a bath. 1. Round up all Pas from cats, cars, babies, house, and yard. 2. Place Pas in washing machine with detergent and good smelling fabric softener. 3. Check on Pas every 3 minutes (Bug’s addition to the steps of bathing). 4. Pin Pas to hangers and dry outside. 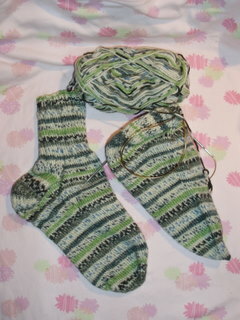 The giant socks are done except for weaving in the ends! They were done in Opal on size 3 needles. They used 108g of yarn! There is only 38g left. How does that add up to 150g? 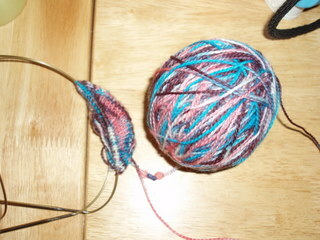 As my Ipod case holder from Iskin just broke today, I cast on an Ipod holder with my hand-dyed sunset yarn. I was already going to do this, but now it is a rush. The second giant sock is nearly done! About 1 more inch of k4p2 ribbing and an inch of k2p2 ribbing. Here is a close up of the stitches. 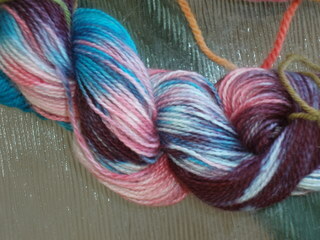 I’m going to take a class tomorrow in kool-aid dyeing at my LYS. Work was better the last two days. We’re working on a paper and I make bargains with myself about “just concentrate and work for one more hour…” I always end up working longer and actually have made good headway on some of the figures. 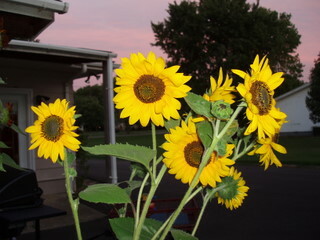 Oh, the sunflowers are BEAUTIFUL! 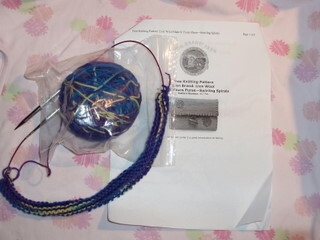 I’ve just joined my third yarn-a-long group! 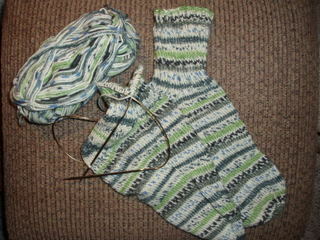 The first was the purse round-up by YarnThing and She-Knits. 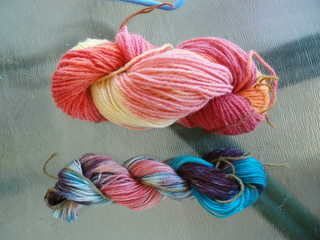 The second was the Lace Shawl KAL and the latest is the Inspired by Nature KAL. I’m hoping the the Inspired by Nature moderator will consider crochet as well as knit items. I’ve also discovered something about myself via this yarn thing… I’m a very process-oriented person. I enjoy having a finished object or item since my “day job” work is very abstract. 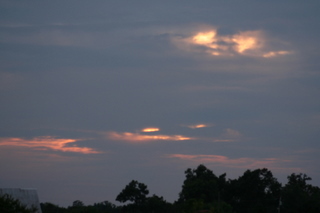 However, I’m almost always in something for the new challenge. Once I’ve got it down (read semi-competent), I’m ready for a new challenge. 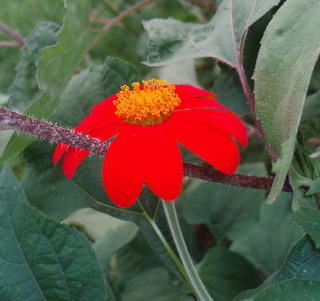 This peculiarity, which mostly results in “doing things the hard way,” does not mesh well with my desire to be a more even-tempered person, as it is often a very time consuming and aggravating way to live… Argh! I think I’m kind of burned out at work. I barely get anything of my own accomplished. I just seem to answer questions from my research students as they come up. I keep piddling around on the computer. The students will be done next Friday. I really like them and they all are working very hard, but I’m ready for a break. 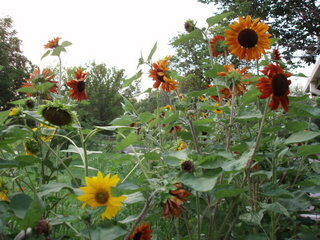 I was trying to put up pictures on flickr, but the uploadr was erroring out. I finally got them up using jUploadr. I don’t know how much of the pictures of Bug that I should make public, though. It scares me that there are “bad people” out there that might be looking at her pictures. What do you all do? 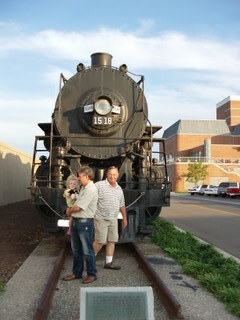 We traveled to Paducah to visit Nana and Pappaw T. Bug had fun, especially on Saturday. 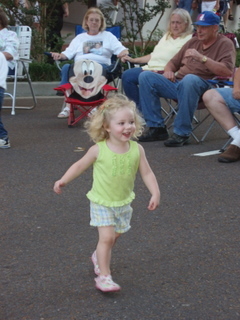 We rode in a horse-drawn carriage in downtown Paducah, saw the train, and Bug danced to some of the music they had on their Downtown Saturday Evening Festival-type thing. Although, today she was under the weather (read cranky, perhaps also sick). DH and I went to the Farmer’s Market and the coffee shop while Nana and Pappaw had fun with Bug. 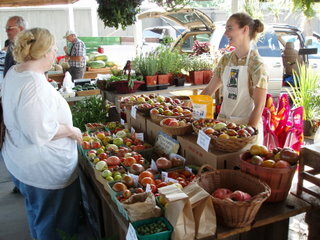 It was very relaxing not to have to chase a 2 year old around or be on the lookout for what she is getting herself into… There was a lady selling heirloom tomatoes, which were just beautiful! 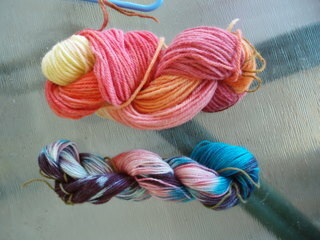 It is about a 3 hour drive and DH drove both ways, so knitting/crocheting in the car was very productive. I visited the LYS (With Ewe in Mind) in Paducah on Saturday. The ladies there are super-nice. 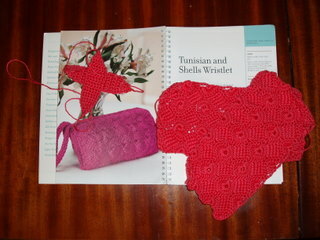 I also found a GREAT crochet book: Hooked Bags. 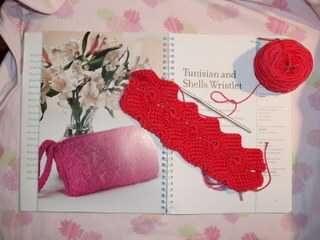 I bought it and some nice cotton and started on the Shells and Tunisian Crochet Bag. I inherited some Tunisian crochet hooks, but never knew what they were until just a few weeks ago. So, it is nice to learn (yet another) new technique. 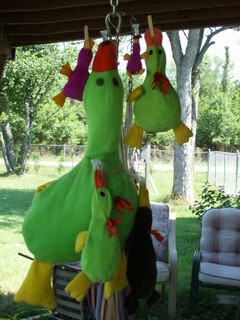 This bags uses the technique, but the number of stitches done in Tunisian is only about 6, so I can use a regular hook. I had forgotten how good it feels to work with soft cotton…. 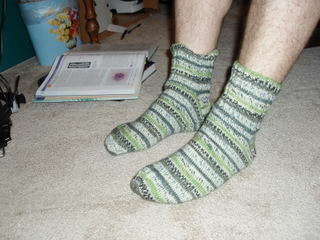 I turned the heel on DH’s second sock (my first pair!). I can see why socks are such a draw… they are so practical, but can get whimsical as well. 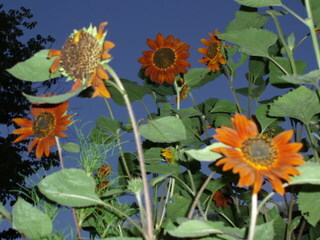 We arrived back home to a bounty of sunflowers, including the first blossom of the deep orange Mexican sunflower!